We have just uploaded the 63rd episode of the Alien vs. Predator Galaxy Podcast (right-click and save as to download)! Our latest episode features an interview with Ian Feuer. 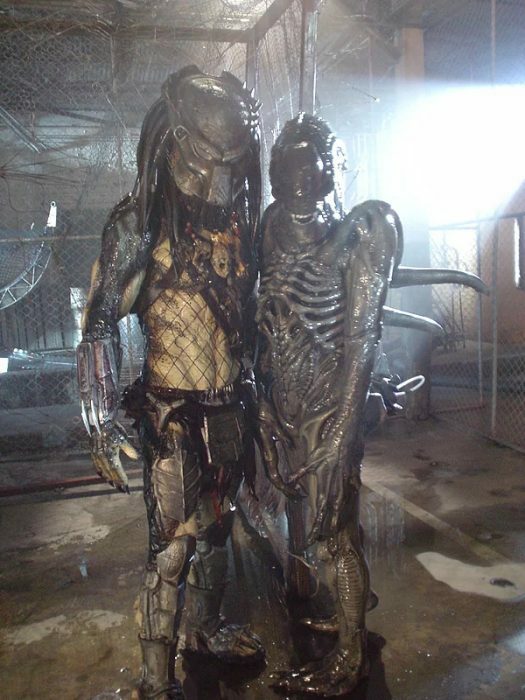 His may not be a name with a connection that instantly jumps out at you but Ian Feuer literally filled the shoes of Ian Whyte as the Wolf Predator (and pretty much every other Predator seen in the film) for several weeks of reshoots that took place on Aliens vs. Predator: Requiem. Ian Feuer, in costume as Wolf, alongside Tom Woodruff in the Alien suit. We discuss going from being an athletic to performing as an intergalactic hunter, what it’s like to play football as a Predator, how the Predators use the toilets and plenty more! You can check out some snippets of the scenes Ian performed in, as well as the football themed ads that Ian helped creature over on Ian’s website! What did you think of our latest episode? Be sure to let us know down below! You can also listen to any of our previous episodes in the Podcast section under the News tab on the main menu. The Alien vs. Predator Galaxy Podcast is also available via iTunes, PodBean and Stitcher. You can also listen/watch this episode on the Alien vs. Predator YouTube channel! Didn't know there were reshoots. Great job on the podcasts as always. Yeah, I'm sure it was reported on at some point. I'll check over the archives when I get chance. I definitely remember the Homeworld scenes as being something that was added during additional shooting. And thanks. Oh so it was him when we first saw Wolf ? This was my favorite scene ! Yeah, cracking that you found the guy. I didn't realise there were more actors other than Ian Whyte for the Predator. This was a great interview ( not that you guys have ever done a bad one). I guess I should say I rather enjoyed this interview instead. Like Darkness, I was completely surprised to find out that someone other than Ian Whyte played Wolf and Co.. Ironically also named Ian. Yep! That's Ian picking up the mask. I didn't realise there were more actors other than Ian Whyte for the Predator. I believe there was one more fella. I remember behind-the-scene snaps of him in the suit leaking before the film came out. I'll find them to post again later. This interview is also available on YouTube! The other Predator actor was Bobby 'Slim' Jones. You’ve blown my mind again! You must interview Bobby Jones. I’m curious as well, what scene is that pic of him as Wolf from? As an aside, It’d be cool if you guys were able to interview one of the suit actors from PREDATORS. Loving these recent ALIENS VS PREDATOR-REQUIEM retrospectives. AVP-R was definately the last time I had lasting fun with this franchise.....though it doesn't feel like 2008 was 10 years ago. While it won't ever happen I'd love an AVP-3. I don't know unfortunately. I'm not sure which scenes Bobby filmed as Wolf. If remember serves I did actually talk to one of them - Carey Jones, I think - for my article on the River Ghost as he also played the River Ghost as well as one of the Predators. Thanks! I'm glad you're enjoying them. The lead ups to AvP and AvPR were really great fun. I'm hopeful we'll get a third one - a "proper" one - some day.